Anger solves nothing, or so they say. Whether or not this is true, we all feel angry now and then. 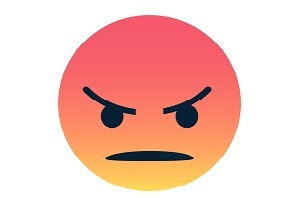 You probably already know the angry synonyms annoyed and irritated, but perhaps you’d like a more interesting range of expressions to describe this feeling? If so, read on! Starting with an adjective that is heard mainly in UK English, cross simply means ‘angry about something’. Children often use this adjective about adults: Mr Walker gets cross if we’re late. Other synonyms of ‘angry’ have additional meanings. For example, someone who is angry because something is wrong or not fair might be described as indignant: He became very indignant when Marie suggested he’d made a mistake. If someone is unhappy and angry because of unfair treatment, you might describe them as aggrieved: Still, she felt aggrieved at their decision. A new word in this area with a specific meaning is hangry, (a blend of ‘angry’ and ‘hungry’). As you might guess, this informal adjective describes someone who is feeling angry because they’re hungry: He often gets hangry just before lunch. Sometimes words such as ‘cross’ and ‘annoyed’ aren’t enough to say how we’re feeling. We’re not angry – we’re furious (=very angry)! : He was absolutely furious with her. We received irate phone calls from customers. Local people are incensed at the decision. Someone who is seething is extremely angry, although trying not to express it: You can sense this seething resentment within the party. If you are very angry and shocked you may be said to be outraged: Am I alone in feeling outraged by his behaviour? She was incandescent with rage. He was apoplectic with fury. Sometimes people suddenly become angry. A common phrase for this is lose your temper: They were behaving so badly that I lost my temper. A more informal phrase with the same meaning is lose it: I’d had enough and I just lost it. When he sees the mess they’ve made he’ll go ballistic. If I see people mistreating animals, I just see red. The kids had been arguing all day and eventually, I just lost my rag. She hit the roof when she found out how much he’d paid for it. A very descriptive idiom in this area is make your blood boil. A situation that makes your blood boil makes you extremely angry: It makes my blood boil when people talk to me as if I’m stupid. Another very vivid idiom is have a face like thunder. If you have a face like thunder, you look very angry: She suddenly came into the room with a face like thunder. Someone who is on the warpath is angry and wants to punish someone for something. This phrase is often used humorously: I’d better warn you, Gabriel’s on the warpath this morning! We hope that nothing makes you feel angry this week! I post the article in the office. It will definitely be useful. “She looks incandescent with happiness” could mean something very different from being angry. So do we need to interpret the word based on context? Does incandescent mean very angry if it stands alone? Hi! Yes, ‘incandescent’ generally means angry whether it’s used on its own or as part of a phrase. @Jay what do you mean? Thanks, Eva. Yes, a good addition! Thanks, Anoop! That’s really good to know. its very much intrested in knowing such things which lend to change in our life..a its very helpful…for me to time spend to know feelings that are unknown to ohers……….!!!! Your bolgs are fantastic and easily understandable. Thanks for sharing your ideas. Just what I wanted to hear, Ali! Thank you. Thanks, Kate, this has really enriched my vocabulary on annoyed and irritated. I was so captivated that I made notes of all the synonyms. It is simply awesome! Well explained. Good selection. Lot of my students appreciate these different ways of expressing anger. It’s quite legit if you reconsider about it. The phrase pissed off is more of a slang than an idiom. Can’t be used in semi-formal or formal texts. Just realized the amount of mistakes in my comment there, which is a huge embarrassment for me since I actually study English, so please disregard it. Also, I did forget to add ‘to be fuming/to fume about something’ which is one expression that that Brits love to use, especially outraged football fans on Twitter when a player from their team makes a mistake, hahah! I like ‘ballistic’ by the way; haven’t heard that one in years. Love these posts, keep it up! Yes, Martin Rose, ‘fume’ a good addition! You meant if boil isn’t a noun, why ‘s’ after the verb boil isn’t there even though the tense is present for [my blood]? Let’s see if Kate has anything to say about that. Hi Saber, ‘boil’ doesn’t have an ‘s’ here, (even though it is a verb) because it’s part of the expression ‘makes my blood boil’. After ‘make’, you don’t inflect the verb. I hope that helps. Thank both of you,mustafa and kate. Hi Georgiana! Thanks for the nice comment and yes, a great addition! I can never get bored of your input. Your blogs are succinct and right to the point. There are extremely useful for both students and teachers of the language. Here is another expression for being angry = go berserk. Mustafa, that’s such a lovely comment – thank you! And yes, ‘go berserk’ a great addition! All the best from Cambridge. Hi Esther. Yes, that’s another, though a little old-fashioned now. Best wishes. I believe…aggrieved, provoked, triggered, offended etc. are also synonyms of angry. Hi! Yes, all nice ones, thanks. Got lots of knowledge about angle. It is useful for beginner like me. I hopes that Kate would continue giving us more posts.